Watching the Lance Armstrong interview I couldn't help but think of the classic saying, "If it seems too good to be true it probably is." This also caused me to consider how often 'sayings' seem to be accurate. Maybe it is because sayings arise from collective wisdom over time. It is this idea of collective wisdom that then caused me to wonder about the ripple effect of Lance's admissions. Will consumers become more skeptical of corporate behaviours? Perth teenager Matt Corby posted a photo of his 'foot-long' sub on Subway's Facebook page. 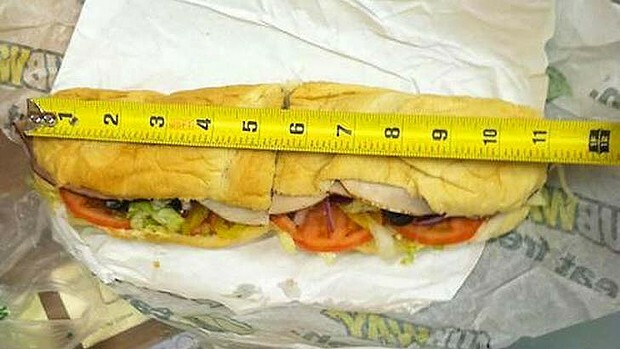 It clearly indicated that his sub was only 11 inches long. That's 91.67% of a 12 inch sub. Imagine if you only received 91.67% of most things that you buy. Collective wisdom suggests to me that most people expect a Footlong Sub to be pretty close to 12 inches long. I don't know about you but I've always thought that a foot long sub meant that it was supposed to be 12 inches long. Given they also have a 'Six Inch Sub' this perception is reinforced by other items on their menu. I quite like Subway and this article isn't about them. Rather, it's about their response and what it represents to consumers. This is what Subway Australia posted on Facebook in response to Matt's photo. "With regards to the size of the bread and calling it a footlong, 'Subway Footlong' is a registered trademark as a descriptive name for the sub sold in Subway restaurants and not intended to be a measurement of length." Which brings me to my point. The Lance Armstrong admission is going to make consumers more skeptical of what they are being sold and the intentions of organisations. It will also make them more skeptical of the responses that organisations provide, such as the response provided above from Subway. You don't have to be a rocket scientist to work out that if your product is only 91.67% of the size that the market expects, but you are 'getting away' with selling it at the smaller size then your cost savings go straight to your bottom line. People aren't stupid. They can work these things out and social media makes it easy for them to provide this feedback. The problem that Subway may have is that their Footlong Subs may in fact only be 11 inches long. In other words, over time their system may have been changed so that is what they produce. Despite the name being 'Footlong' they may have created a system that creates a gap between what they are marketing and what they are actually saying. These decisions may have been made a long time ago with the benefits of those changes going to Subway and not their consumers. No doubt many organisations have made similar decisions - but these decision create a Market Communication Gap. What the market perceives they are going to get is different to what it actually gets. Ultimately this creates poor service. What are your thoughts? Will Lance Armstrong's admissions drive consumer skepticism and what does this mean for organisations?